State experts warn autumn’s cool, crisp weather make October and November peak season for adult ticks. The spike in tick activity comes as Connecticut’s famed foliage draws leaf-peepers and hikers to the woods where the risk of a tick-bite is highest. The spike also comes just a month after the NBC Connecticut Troubleshooters first cautioned a popular shrub called Japanese barberry is linked to higher numbers of Lyme disease-carrying ticks in our forests. Japanese barberry is an invasive species and spreads from home gardens to the wild, where it proliferates quickly and can stop native plants and trees from growing. State scientists studying the plants learned the dense thickets barberry forms in the wild provide added advantages to ticks and their research shows an acre of forest with Japanese barberry averages twelve times the number of Lyme disease-carrying ticks as a forest without it. It grows rampant throughout the 230-acres of forest conservation at Highlawn Forest in Middlefield. Lindsay Suhr, the land conservation director for the Connecticut Forest & Park Association, told the NBC Connecticut Troubleshooters the spot is popular with hikers, but added phones are ringing with calls from, "people worried about going outside," as word spreads about the dangers of ticks and their connection with the plants. Suhr explained the association works hard to keep trails clear of barberry and other brush to keep tick numbers down, but that it’s an uphill battle against the resilient shrubs. While younger ticks have mostly retreated beneath fallen leaves by this point in the season, state scientists told the NBC Connecticut Troubleshooters adult ticks can take advantage of the added warmth and humidity in dense thickets of Japanese barberry to remain active well into December. At the adult stage of life, ticks specifically search for larger hosts like deer and humans, as opposed to rodents, to satisfy their needs before mating and laying eggs. They thrive in cooler temperatures and, as Dr. Scott Williams, one of the state’s top researchers into Japanese barberry and ticks explained stands of Japanese barberry trap the added humidity and warmth they need to survive dry autumn and early winter air. The NBC Connecticut Troubleshooters joined Williams and his team on a walk through Highlawn Forest where they quickly collected multiple ticks seeking a host. Williams stressed it’s important to get outside, despite the risk of a tick-bite, and added folks should, "enjoy the fall foliage and go hiking, but you should certainly be aware and do tick checks." If you do find a tick latched on you, our state’s tick-testing program will test it for free. The first step is bringing it to your local health department as soon as you can. So far this year, the program has tested over 4,800 ticks for the bacteria which causes Lyme disease and other tick-borne illnesses. Dennis Johnson, the health director in Guilford, says at least 35 of those have come from his office. Lyme disease, he said, is endemic in Guilford and on residents’ minds. He stressed the importance of bringing ticks in as soon as they are found and pulled off. Having the tick tested, rather than yourself, can tell you if you’re at risk for an infection and possibly save you a trip to the doctor. Most health departments, like Guilford’s, will help you identify ticks and tell you if it needs to be tested before sending them off to the state’s tick-testing program. There are some that charge a processing fee, and several who ask their residents to send ticks directly to the state. The NBC Connecticut Troubleshooters prepared a map to help you find your local health department and whether or not they charge a fee. Click on your town to find contact information for your local municipal health department, as well as details they provided the Troubleshooters on how to submit ticks for testing. If you find a tick on a person or pet, consider sending it in for testing to your local municipal health department. Experts test ticks for bacteria and parasites including Lyme disease and Babesia, and they say the data helps track changes in tick populations and infection rates. The NBC Connecticut Troubleshooters learned municipal health departments throughout Connecticut have varying procedures for accepting ticks. Some charge fees, and the majority require ticks to be brought to them in person, though others will accept them through the mail. 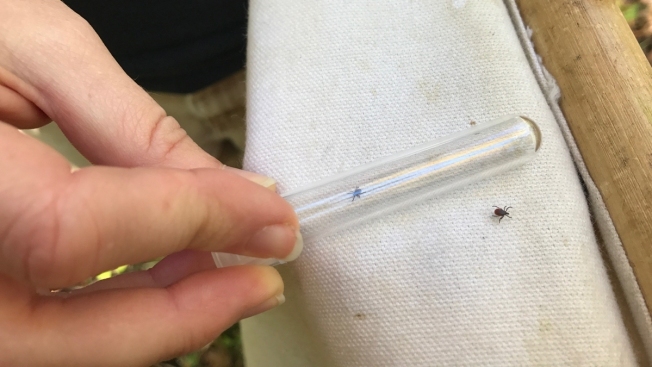 Several towns ask residents to send ticks they find directly to the Connecticut Agricultural Experiment Station’s Tick Testing Program. To contact CAES, click here. For more on how to submit the tick you found, click here.